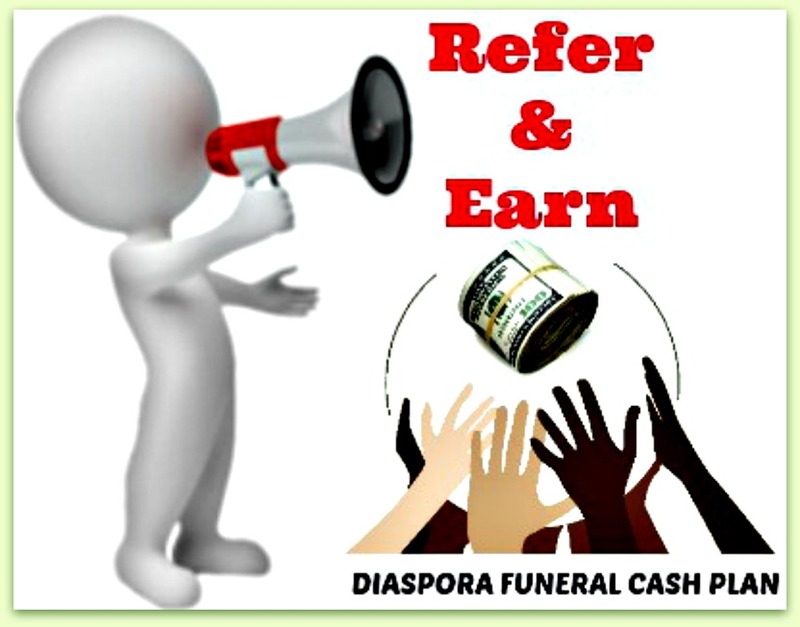 Diaspora Funeral Cash Plan is a funeral insurance cover that was developed with special consideration of the diaspora communities and it pays out immediate cash to cover funeral and/or body repatriation costs. Upon a valid claim cash is released within 24hrs to the appointed beneficiary. This helps your family to cover the costs of your funeral including repatriation of your body if that is your wish. The average funeral can cost several thousand dollars, and with a funeral plan, your family will have the money on hand to help pay for all these high expenses. Traditional funeral cover is usually offered as goods and services provided by funeral directors and that has too many limitations. For diasporans who are essentially global villagers or transnational citizens is better to have a US$ cash cover because cash knows no border which makes it a protection without borders. Cash also means you can cover other related costs like family travel, church service, etc. With a cash cover body repatriation is also optional. The cost of a funeral and/or body repatriation to home country runs in several thousand dollars on average. Funeral Cash Plan is so important because it will save your bereaved family the burden and embarrassment of begging for help during your funeral. The cash plan guarantees you an honourable and dignified sending off as your loved ones can celebrate your life without worrying about money. 5. Funeral Cost in home country. The main costs that the Diasporas face in the event of death include: 1. Body Repatriation, 2. People (family or friends) to accompany body back home, 3. Cost of coffin or casket, 4. Funeral Cost in diaspora, and 5. Funeral Cost in home country. Funeral and body repatriation costs from southern Africa countries costs around US$2, 500, from United Kingdom around US$10, 000, from Australia/New Zealand around US$15, 000 and USA or Canada around US$20, 000. If you don't have a funeral plan, this is money your family will probably have to pay out of their pocket in the event of your death…money your family may not have on hand. Having Diaspora Funeral Cash Plan guarantees you peace of mind and helps your family meet the high cost of a funeral and/or body repatriation by paying out an immediate cash benefit in the event that a planholder passes away. Cover ranges from $2, 500 to $20,000. Will The Currency Of Cover (US$) Ever Be Changed? NO - the cover is permanently denominated in US$s to give cover-holders better long-term value against currency volatility and inflation. The currency of cover (US$) is guaranteed in writing on the policy document and in our Terms & Conditions. If you're a Zimbabwean diaspora aged between 18 and 75, you automatically qualify for Diaspora Funeral Cash Plan. A Funeral Cash Plan is something all diasporas should consider. The worst can happen at any time and, without funeral cash plan, your family and friends could be forced to pay thousands out of their pocket for a funeral. If the can't raise the money they will have no option but to do the most demeaning and embarrassing public appeal. With the Diaspora Funeral Cash Plan you can also include your partner, financially dependent children until they reach age 23, parents and/or in-laws in Zimbabwe under your policy. This guarantees every member of your whole family a dignified sending off where their loved ones can celebrate his/her life instead of begging for help. Funeral cash plan also has a guaranteed payout whereas life cover claim may be rejected by the insurer an some reasons like non-disclosure or giving wrong/misleading information on application? The cover is underwritten by Zimnat Life which is a subsidiary of Sanlam Life. The parent company, Sanlam Life is one of the biggest insurance conglomerates in the world with operations worldwide and is rated AA+ by Fitch Ratings. Getting a Funeral Cash Plan may be one of the most important decisions you'll ever make. With the right funeral insurance policy, you and your family can enjoy peace of mind knowing that the high costs of your funeral and body repatriation will be covered when the time comes. Of course, not all funeral cash plan are the same, and when choosing your policy, you have many things to consider. How much cover do I need? Diaspora Funeral Cash Plan provides cover from $2,500 up to $20,000. Do I qualify? If you're a Zimbabwean living abroad aged between 18 and 70, you're eligible to apply. You can select a cover option that suits your needs and budget, from a $2,500 benefit payout through to a $20,000 benefit payout. As an insurance product Diaspora Funeral Cash Plan is a world first it is an innovative response to a crisis facing all diaspora communities. Diaspora Funeral Cash Plan is very important and that's why it's as easy for you as possible to apply for cash plan. You can quickly generate a quote and apply online in just a few short minutes or you can call an of our offices worldwide, and you won't have to answer any health questions or take any blood tests. And once you're accepted which is guaranteed, you can keep your policy for life. No one looks forward to applying for funeral insurance. That's why the process is as fast and easy as possible. For Zimbabwe diasporas aged 18 - 75, getting your funeral cash plan is as easy as 1-2-3. Yes - you can nominate up to 2 beneficiaries as part of your Diaspora Funeral Cash Plan policy, simply by entering their names when you apply for your cover. The beneficiary are ranked such that number two beneficiary can only claim the money if beneficiary one is not there and beneficiary three only if both one and two are not there. Is The Money Back Guarantee? Am I Covered If I Am Change Country Of Residence Or Return To Zimbabwe? Direct Debit or Standing Order – this is available in most countries worldwide. The Diaspora Funeral Cash Plan provides immediate cover for accidental death and a little as 3 months waiting period if death is due to natural causes. Death resulting from criminal activities, nuclear explosion, mountaineering, parachute jumping or skydiving, and war is also excluded. Yes. Funeral Expenses Cover has been designed to be family friendly. You can choose to cover your life (Single Plan), or cover yourself, your partner and all children who are dependent on you until they reach age 23 (Family Plan). There is no limit to the number of dependent children that can be covered under the Family Plan. As long as you pay your premiums, the cover is guaranteed for the rest of your life and you'll be covered anywhere in the world, 24/7 – even if your health and circumstances change. More importantly after 20 years of continuous cover you get covered for FREE indefinitely.